While Laia and myself were in Iceland, we tasted some of the best breads we have eaten (not counting German breads, of course), and decided to get a bread machine at home. I eat a lot of bread for breakfast, either toasts with butter or with olive oil and cheese, and this may definitely mean some money saving. A very gross estimate puts the cost of a 500g French bread from the machine at 2.2€, probably closer to 1.5€ (I have also counted costs of seeds for flavouring) or less. While a pre-made sandwich style bread costs around 2€ for 450g. Home made bread has a disadvantage in my case: it lasts less than the bought one. Why? It tastes definitely better, and I end up eating a lot more. Below I have a recipe my girlfriend uses to do me, and I love it. 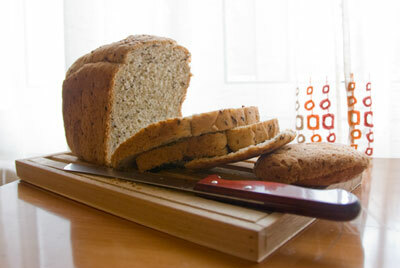 I love the taste of sesame seeds and sunflower seeds, and the flax seeds give the bread a very interesting flavour. Check it out! Beware, it is a recipe intended to be done with a bread machine! Some day we will try to remove a little olive oil and a little sesame paste (tahini), because I love the sesame taste in my dishes. Your recipe sounds great! Gracias por participar en el World Bread Day.